With the second Intifada in 2000, Israel intensified its systematic destruction of civil, political, economic, and welfare infrastructures in the West Bank and Gaza. Alongside the massive building of roadblocks, military checkpoints, earth mounds and the Separation Wall inside the Occupied Territories, the aim was to create what Gordon and Filc call ‘insecurity and endemic uncertainty’ as a means of controlling the population and weakening resistance to colonial rule.1 Thus deprived both physically and psychologically of the means of mapping and safeguarding its own future, Palestinian society became increasingly dependent on international charity organisations. Irrespective of their efficacy (or motivations), many of them provide support for non-political Palestinian cultural events, forging links with the diaspora and foreign countries. Over the years these events have likewise been targets of attempts to stifle Palestinian cultural development in the name of (Israeli) ‘national security’, among the most recent examples being the ban on the schools-based Palestinian Cultural Festival in March,2 and the (unsuccessful) attempt to close down the international Palestine Literary Festival in May.3 It is against this background that one needs to appreciate the realisation of Palestine c/o Venice at the Venice Biennale. The possibility of a Palestine Pavilion appears not to have been raised again until the preparations for the 50th Venice Biennale during 2002, when the curatorial director Francesco Bonami fielded the idea to the Biennale committee. The proposal was rejected on the grounds that only nation-states officially recognised by the Italian government qualified for a pavilion in the Giardini,6 However, the New York Times in an interview with Bonami reported that the morning after the briefing the local Venetian newspaper Il Gazzetino carried an article criticising the proposal as ‘needlessly provocative or even anti-Semitic’:7 a too prevalent ‘logic’ that concludes Palestinian ‘identity’ must ipso facto be defined ‘against’ Jews whilst dismissing the complex, heterogeneous identities that constitute both the historical and contemporary Palestinian subject. Undeterred, Bonami commissioned an installation to be sited in the Giardini from the architect team Sandi Hilal and Alessandro Petti as part of his theme, ‘Dreams and Conflicts’. The resulting Stateless Nation comprised ten seven foot tall free-standing replicas of the various travel or identity documents issued to Palestinians, including Israel’s special Jerusalem identity card, travel documents from the Palestinian Authority, Egypt or Lebanon, and European or U.S. passports. Dispersed amongst the national pavilions, Stateless Nation was a statement of the ruptured spatial reality of a people united by a shared ancestral homeland and memory of an unsurpassed injustice and yet without national citizenship and representational rights.8 Stateless Nation, however, spoke also to the paradox of globalisation where the borderless movement of capital and a minority of the world’s elite are inversely mirrored by the rise in restrictive border controls and mounting numbers of dispossessed refugees and detainees. Despite the absence of a national pavilion, Biennale curators have regularly selected Palestinian artists on the basis of individual merit, most notably Mona Hatoum and Emily Jacir, the latter included in both the 2005 and 2007 editions. Jacir’s installation Material for A Film – Retracing Wael Zuaiter demands some attention as, on the one hand, it offered a memorial that filled the absence underlying APJP’s complaint, yet in a form by which one could identify with the experience of loss usually absent from ideologically motivated state-sanctioned memorials; and on the other, it questioned the representation of a widely demonised people, providing some insight into the aims of the subsequent Palestine c/o Venice. 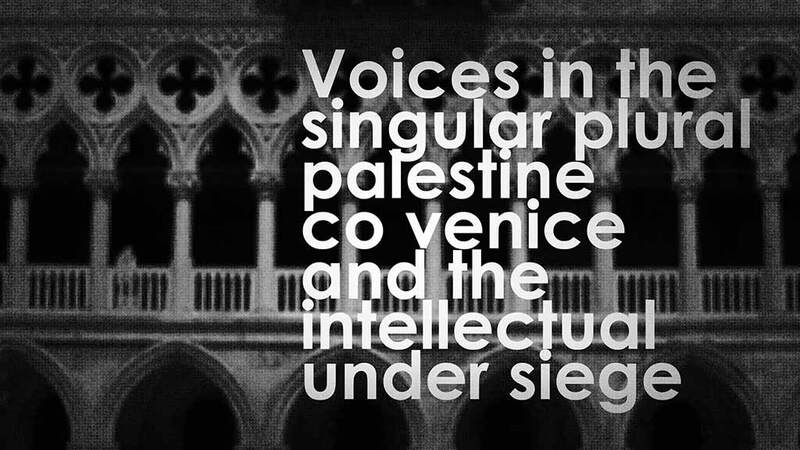 Given the sensitivities and ‘interests’ that entangle any mention of Palestine, it is something of a miracle that Palestine c/o Venice materialised in the 53rd Venice Biennale, albeit as a ‘collateral event’, comprising performances, an exhibition located on the Giudecca in the former Convento dei Santi Cosma e Damiano, and a one-day symposium in Spazio Thetis, Arsenale. The successful realisation of the project as a dignified presentation of Palestinian aesthetic and conceptual concerns was due in large measure to the energy and commitment of the curator Salwa Mikdadi with the support of the commissioner Vittorio Urbani of Nuovo Icona Venice, which has been responsible for sponsoring other marginalised nations such as Wales, Azerbaijan and Lebanon. Clearly, success presented unprecedented challenges requiring a range of sensitive negotiations, not least Mikdadi’s determination to raise the finance from private Palestinian sources unaffiliated to either political factions or foreign aid programmes, a contortion that, one suspects, other Biennale participants do not have to perform. Palestine c/o Venice was not however free of controversy, as I shall relate later. The curatorial decision to avoid work that directly represented people was a strategy to bypass the clichés circulated by the international media. As Hilal and Petti said of their audio-installation Ramallah Syndrome, the deliberate refusal of the image was a response to the fact that ‘Palestine was overdetermined by media images of a landscape of violence and destruction that obliterates the reality and voices of the people themselves.’ The exhibition raised further issues: Who, or which Palestinian societies, was the event speaking to and for, given the heterogeneity of geography, class and religion? What productive role could the artist play under conditions of perpetual social crisis? How was the exhibition to represent the ‘non-existent’ existence of Palestine in the context of a biennale where most pavilions were representative of a national state identity? The sensitivity of this latter issue was apparent at the outset when the term ‘collateral event’ was criticised during the inauguration by Laila Shadid, the Palestinian Representative on the European Commission, as being too resonant with the military euphemism, adding that the event revived the Palestine Pavilion lost in 1948. The tendency however to refer to the event as a ‘pavilion’ was challenged during the symposium discussion as being prematurely complacent given the precarious status of a ‘collateral event’, which, unlike national pavilions, has no permanent authority or designated location and is dependent on external approval – in fact, echoing the status of Palestine’s political authorities themselves. If one can suggest an exhibition focus it was structural issues that emphasised the human dimensions of daily life lived, poignantly visualised in HabidAllah’s animations, under the imposition of a militaristic model of public and private space, which – familiar to us from Northern Ireland – dispossesses the self as a free agent in networks of social exchange of goods and information, work and pleasure. Given this spatiotemporal disruption, Palestine c/o Venice reflected the recent intersection of artists’ concerns with those of architects and urban planners, represented by artist Rabah with Riwaq’s 3rd Biennale 2009, A Geography: 50 Villages, which was presented as a ‘biennale within a biennale’, and Hilal and Petti’s Ramallah Syndrome. Riwaq’s 3rd Biennale sought to answer the question who do we represent, and to whom, through a modest exhibition display of their projects and a performance-conversation intended to generate a multiple dialogue between visitors to both the Venice and Ramallah exhibitions and among the ’50 villages’ that were the focus of its presentation, to be extended later via an exchange with architecture students from Central St Martin’s School of Art. In other words, to reconceptualise the ‘biennale’ in a way that would include communities excluded from the site of the initial event. The ’50 villages’, ironically represented through touristic postcards, constitute a terrestrial archipelago of local communities, whose mutual isolation Riwaq intends to reverse by linking site specific art projects in the villages and actions across the land that, in the words of Suad Al Ameri, Riwaq’s Director, ‘reweave what the colonial Israeli state breaks’. The complex issue of urban spatial politics was the subject of a major discussion around Hilal and Petti’s Ramallah Syndrome. The installation itself consisted of a self-contained dark room, accessed by a door inset with a small observation window like that of a prison cell or hospital room, which was nevertheless impossible to see through. The interior of the room, lined with thick grey padding, presented a soundscape by the artists Ruanne Abou-Rahme and Basel Abbas of conversations together with digitalised sonic ‘interferences’ that evoked anxious crowds, or the crackle of exploding bombs and rockets. The conversations centred on the ambiguous status of Ramallah, now the centre of Palestinian political, commercial and civic structures as well as international NGOs and refugees from destabilised parts of Palestine. The crux of the ‘Ramallah syndrome’ was that it presented all the outward everyday signs of a ‘normal’ city, of the desire of its citizens to lead a ‘normal’ life, in contrast to the travails experienced elsewhere in the Occupied Territories and Gaza; that is, the underlying militaristic model of space was overlain by an appearance of ‘normality’, in what some commentators called an ‘illusion of the co-existence of freedom and occupation’. Was this, as some asked, a fertile ground for resistance; or was it rather a panopticon and therefore better described as a colonialist ‘normalisation’ enterprise that satisfied the ‘developmental’ demands of the international community and Israel’s ambition to undermine Palestinian rights to East Jerusalem as its capital city? The desire for ‘normality’ and its frustration resurfaced in HabibAllah’s animation films, Ok, hit, hit but don’t run, 2009, in which a looped sequence of little humanoid figures performing the actions of everyday life, are periodically overwhelmed by a regiment of graphic lines, leaving a single figure trying to escape over a wall. Surrounded by Israeli military checkpoints, watchtowers, highways and separation walls, and monitored by overhead drones, there must be few Palestinian villages or cities that cannot be described as panopticons. Al Malhi presented two works that conveyed the claustrophobia of such surveillance. The Gas Station, 2007-09, consists of two video monitors supported on breezeblocks. A stationary camera observes the monotonous comings and goings at a petrol station on the periphery of the Shufhat Refugee camp in Jerusalem, long since forced to close down and functioning merely as a point of social interaction for a group of dislocated young men. Al Malhi’s panoramic photograph of the camp, House No.197, 2007-09, and shot, as he describes in the catalogue, from the neighbouring Israeli settlement, offers an alternative to the touristic views of Jerusalem, revealing a crowded ad hoc building programme that oscillates between permanence and temporariness, hope and despair. The sense of existing in a spatiotemporal limbo between memory and oblivion was conveyed by Batniji’s exhibits, Date Video, 2006-ongoing, and Atelier (22.06.2006 – 07.06.2009), which was juxtaposed with Hannoun, 1972-2009. Prevented from returning to his home in Gaza by the border closure in 2006, the date ticker of Date Video records the passing days since this separation. Atelier is a photograph of his now inaccessible Gaza studio, the surfaces and floor covered in grey dust, disturbed only by the traces of footprints. Hannoun presents a floor scattered with the shavings of sharpened red-painted wooden pencils, which appear like faded petals among the metallic grey particles of lead. In the catalogue Batniji likens the shavings to a field of poppies, a national Palestinian flower often associated with the memory of freedom fighters. Since WW1 the poppy has also had a memorial resonance for the European; it flourishes in soil that has been disturbed, and is therefore a symbol of hope and regeneration as well as remembrance, a function that Hannoun ambiguously also attributes to art. If there was a counter-narrative to Palestine c/o Venice it was the issue of aesthetic and conceptual criticality drawn across the historical dimension of Palestinian art advanced by Kamal Boullata’s cautionary symposium presentation, in which he questioned the lack of recognition of Palestinian modernism and its temporal disjunction from ‘postmodern’ Palestinian art, now locked in a globalised scenario in which cultural difference merely becomes a marketable commodity. Jacir’s project for Palestine c/o Venice, stazione, 2009, also intended to convey a spatiotemporal continuity, in this case a celebration of Venice’s historical relations with Arab cultures, and with the hope – commensurate with the intentions of the exhibition organisers – of cementing contemporary relations with the city leading to possible future cultural exchanges. The fate of Jacir’s project, however, highlights the precarious position of the Palestinian intellectual subjected, despite the best of intentions, to hostile political interests. Jacir had done considerable research on Venice as the historical confluence of trade between the East and Europe, particularly the city’s cultural and economic interactions with Palestine, much of which she summarises in her catalogue statement.20 The finalised project was to add translations in Arabic to the names of each of the vaporetto stops on Line 1, which is Venice’s main artery, running through the Grand Canal from Lido to the Piazzale Roma and passing many of the buildings, including the Doge’s Palace, Torre dell’ Orologio and Ca’ d’Oro, that demonstrate Arabic influences on the city’s architecture and decorative design. The beauty of the project is conveyed in the digitalised photo-maquettes of various vaporetto stops, whose elegant Arabic calligraphy invokes a number of associations: the origins of writing in the pre-history of the Middle East, the centrality of poetry and song to Arabic culture, whose influence may have entered Europe through the Al-Andalus troubadours, and the numerous Arabic words absorbed into the Venetian dialect. Jacir focuses, however, on Venice and Palestine’s shared maritime traditions, taking the title of her work from the fact that Venetian ships dominated the transport of pilgrims to the Holy Land, ‘thus Venice fashioned itself as a “station” on the sacred itinerary of the pilgrimage route to Jerusalem.’21 Of course, stazione has a contemporary more secular relevance, given that the Venice Biennale is the primary rendezvous of the artist-troubadour: the confluence of global artistic practices and the exchange and migration of aesthetic ideas and experiences. Moreover, the ‘station’, like the postal drop, is a suspended moment in the itinerary of the migrant traveller. stazione carried no political connotations, in contrast to Kamal Boullata’s proposal that a free Palestine c/o Venice boat be available between the Giardini and Giudecca; whilst this was rejected at the outset on ‘financial’ grounds, one could not miss its resonance with the Free Gaza aid boats persistently hijacked by Israeli special forces off the Gaza coast. Initial enthusiasm together with written approval for stazione was given by all local authorities concerned – the Biennale Committee, the commissioner Nuova Icona and the Venice Comune – with a verbal agreement from ACTV, the vaporetto company; and yet a month into production, Jacir via Nuova Icona, again verbally, was abruptly informed by ACTV that the project was cancelled. Despite emails and telephone calls appealing to ACTV for an explanation from the Palestinian and Italian organisers and various prestigious gallerists – most of which went answered – the decision was not revoked. The Biennale Committee declined to intervene on the grounds that it was a matter between the artist, curator and ACTV. To date no satisfactory explanation has been given aside from vague allusions to ‘political pressure’ from an ‘outside source’, and equally oblique references to the Gaza bombing. One can therefore only speculate on the ‘political’ source and the nature of its objection. The Venice Comune is traditionally politically left, and technically independent of central government; but it is surrounded by the Veneto’s right wing, neo-nationalist Lega Nord party, which supports Berlusconi (with a reputed personal interest in the Biennale), and which in the past has vociferously opposed the building of mosques. If Gaza was on their minds, paranoia of an ‘Islamist terrorist’ attack against a work that favourably presented Arabic culture seems singularly improbable; which leaves fear of reprisal or ‘pressure’ from the Israeli-Zionist lobby. If ‘security’ was an issue, one can envision that the city authorities were happy for ‘Palestinian art’ to be confined to a space on Giudecca (where no security presence was in fact observed), but not exposed along the length of Venice’s main thoroughfare, however minimal and discrete its intervention. Arabic script itself cannot have been the cause of offence since the United Arab Emirates Pavilion had been allowed to plaster multi-lingual posters all over the city. The subsequent events were no less exasperating than the obscurantism of the Italian authorities. An announcement of the cancellation of Jacir’s project was made at the symposium together with admission of the lack of explanation. A query as to why Jacir was also absent from the symposium and why there was no press coverage of the unusual circumstance was met with an embarrassed silence, leaving the floor with the unproductive impression – justified or not – that there was little solidarity for Jacir among the organisers and the other artists. What one can piece together from the participants in this scenario is that Jacir was persuaded to keep a low profile in order not to prejudice the success of the Palestine c/o Venice event and any possible sequel. Whilst this is understandable, given the delicate circumstances within which Palestinian artists and curators have to operate, in the end one has to ask whether the option of silence falls precisely into the trap that Said warned against regarding the role of intellectuals. To ‘speak truth to power’ it is not enough to avoid anything that might attract unwelcome attention or suspicion; quiescence conveys a fatalistic atmosphere bereft of criticality and confidence that Palestine’s enemies do not hesitate to exploit. Jacir, of course, is not the only artist to be censored in a Venice Biennale. In 2005 the German artist Gregor Schneider, another recipient of the Leone d’Oro, proposed Venice Cube, a large black cube made of scaffolding and fabric to be sited in the Piazza San Marco, that made an admittedly clumsy reference to the Ka‘ba shrine in the courtyard of the al-Haram mosque in Mecca supposedly alluding to shared European and Arabic geometric traditions. The proposal was rejected at the outset on ‘political’ grounds (according the Biennale’s president Davide Croff); ‘it would block the view of one part of the square… and could hurt the religious emotions of the Muslim community.’22 Like Jacir, Schneider has never received an official explanation. However, what absolutely distinguishes Jacir’s project from Schneider’s is that stazione’s connotations are completely secular, referring to Arab-Venetian cultural exchange not Islam. And it is precisely this slippage between ‘Arab’ and ‘Islam’, whether through ignorance or malice, that hinders any just public discussion on Palestine among the international community. Rather than Schneider’s project stazione is comparable to Joseph Kosuth’s ‘collateral event’, The Language of Equilibrium, 2007, that took place in San Lazzaro degli Armeni. Kosuth’s work was likewise based on local historical research: in this case, on the founding of San Lazzaro by persecuted Armenian monks, who became famous for their multilingual library and printing press. The installation consisted of lexical terms and signs symbolic of water fashioned in yellow neon and writ large in Armenian, Italian and English on the architectural façade. Armenia itself is not without political controversy, having long demanded recognition for the genocide perpetrated by the Turkish government in 1917. Whether or not the cancellation of Jacir’s project originated in local, strictly Italian politics, it nonetheless played into the hands of Israeli and pro-Zionist policies of isolating Palestinians and the Palestinian narrative from the international community, and this is what gives grave concern. Israeli tactics have become rather more sophisticated since the era when intellectuals like Zuaiter were primary assassination targets.23 In terms of manipulating international opinion, Israel now employs hasbara (Hebrew meaning both explanation and propaganda),24 which was visibly mobilised by IDF spokespersons to justify Israeli actions to the international press during the Gaza massacre. But hasbara also relies on influential international pro-Zionist lobbies, on the one hand, to promote a non-belligerent image of Israel,25 and on the other, to attack arguments challenging Israel’s official narrative. There is ample evidence of pressure to discredit, intimidate or harass journalists, artists, scholars and diplomats who raise their heads above the parapet, a facet of Israeli propaganda that receives insufficient coverage in the press. Among examples one can cite the following: the Zionist Federation accused the BBC of anti-Israeli bias for broadcasting its Middle East Editor Jeremy Bowen’s account of historical events (to which the BBC acquiesced),26 as well as anti-Israeli bias in its coverage of the Gaza massacre, although subsequent analysis has found that not only the BBC’s but also Al Jazeera’s English reportage was heavily weighted towards the Israeli version of events.27 Following the publication of her book Facts on the Ground: Archaeological Practice and Self-Fashioning in Israeli Society, in 2007 a supposed ex-alumna resident in Israel circulated a petition that tried (unsuccessfully) to have anthropologist Nadia Abu El-Haj’s tenure at Columbia University terminated. A similar threat was made against the Arab political scholar Joseph Massad’s Columbia post following his publication of a review in Art Journal analysing the extent to which the Israeli art historian Gannit Ankori had appropriated the original research of the artist Kamal Boullata for her book on Palestinian art.28 On the basis of a few minor errors that did not fundamentally affect Massad’s argument, the American publishers were threatened with libel action through the pro-plaintiff English courts if they did not withdraw the article and award Ankori compensation, a threat to which they succumbed rather than risk insupportable legal costs, a fate which also befell the English publishers of Art Book following a similarly critical review.29 As reported in the Guardian, ‘libel is a legal weapon of choice wielded by those who want to muzzle a critical press’, and, one might add, with greater financial resources than are available to the average arts publisher.30 In 2004 the filmmaker Eyal Sivan filed a libel suit in the Paris courts against French philosopher Alain Finkielkraut, known for equating criticism of Israel with anti-Semitism, who had spuriously claimed Sivan’s film Route 181: Extracts from a Palestinian-Israeli Journey, a collaboration with Palestinian filmmaker Michel Khleifi, plagiarised Claude Lanzmann’s Shoah. At the same time Jewish-French intellectuals and Israeli representatives successfully lobbied the Centre Pompidou against screening the film; the European cultural channel Arte cancelled Sivan’s commission for further films on the Middle East and he lost his teaching position at the French Ministry of Education’s Centre for Information Media (CLEMI). 31 What is particularly distasteful about all these cases is the decidedly undemocratic means, politically motivated and reinforced by legal threats, to censor academic and artistic freedom of debate, which ultimately puts into question the authenticity of Israeli scholarship itself. Not least, the intellectual has a special significance because he or she presents Palestine’s modern sophisticated face in contrast to the ‘victimised subject’ or ‘irrationally violent Islamist’ favoured by the media. That Israel feels it is now losing its grip on the propaganda war against the pro-Palestinian narrative is evidenced by a recent report, The Israeli Project’s 2009 Global Language Dictionary, leaked by a former insider of the American Israel Public Affairs Committee (AIPAC), designed to tutor Israeli supporters in the use of the appropriate language to put the best spin on the Israeli perspective.32 Meanwhile, Binyamin Netanyahu is reported to have cynically adopted Nazi-era terms like Judenrein to justify Jewish settlements in the West Bank and East Jerusalem to the Americans33. It goes without saying that support for Palestinian rights has nothing remotely matching this level of political influence and financial resource34. There is something frankly ugly and undignified, not to say immoral, about these efforts on the part of a nuclear-armed, self-styled liberal democracy and its supporters to justify what must be the most blatant example of systematic cultural genocide since the attempts by colonial America and Australia to eradicate indigenous peoples. Given that the effects of globalisation and multiple diasporas have rendered the nation-state’s ‘imaginary communities’ almost redundant, to cling to 19th century concepts of nationalism, Zionist or indeed Arab, seems anachronistic. What remain to be fought for are basic human rights to homeland, security, freedom of self-expression and self-determination, increasingly translated not in terms of 19th century nationalism but as the biopolitical struggle for diverse ‘forms of life’. However, have Palestinian Arabs in fact recognised this reality and begun to move on? Notwithstanding the bluster of political Islam, a shift seems to be taking place within the Occupied Palestinian Territories of which the artists participating in Palestine c/o Venice may be its ambassadors. Bekah Wolf reports on a popular non-violent and non-politically aligned movement of community activism, specifically quoting the Palestine Solidarity Project in Hebron, which, like Riwaq’s ’50 Villages’, represents the potential to undermine imaginatively the ‘insecurity and endemic uncertainty’ of Israel’s spatiotemporal ruptures.35 That Wolf also reports that the organisers of this pacific movement have become the targets of ‘Administrative Detention’ by the Israeli security forces is, by contrast, yet another testimony to Israel’s ossification in a mythic past and failure to imagine a more humane and equitable future. 1 Neve Gordon and Dani Filc, ‘Annihilating the Logic of Risk: Israel’s Military Occupation and the Ascendancy of Hamas’, in The Aesthetics of Risk, [ed] John C. Welchman, Zurich: JRP/Ringier, 2008, pp 81 – 111. The authors’ main argument is that the popularity of Hamas is less to do with a turn towards religion than its effective social welfare programmes. 3 Victoria Brittain, ‘Literary Festival defies ban’, Palestine News, London, Summer 2009, p 29. 4 Jack Persekian, ‘Act of Reconciliation’, Salwa Mikdadi (ed), Palestine c/o Venice, catalogue to the exhibition, Beirut: Mind the Gap, 2009, p 20. 5 Jonathan Cook, ‘Israel’s plan to wipe Arabic names off the map’, The Electronic Intifada, 17 July 2009; accessed 14.07.09. 6 As the inauguration of the Roma Pavilion in 2007 in Cannaregio demonstrated a stateless nation could site a ‘pavilion’ elsewhere in the city. 7 Christopher Hawthorne, ‘The Venice Biennale’s Palestine Problem’, New York Times, June 01, 2003; accessed 17.07.09. 8 See ‘Stateless Nation’, Archis, Special Edition Biennale Venezia, 2003, Amsterdam: Stichting Artimo, 2003. 9 On the contrary, as Haim Bresheeth relates, post-1948, Israel prohibited the Palestinians any form of memorialising or mourning their loss (‘The Nakba Projected: Recent Palestinian Cinema’, Third Text, 80-81, vol 20, issue ¾, May/July 2006, pp 503-04). This July, Israel’s education ministry ordered the removal of the word ‘nakba’ from Arab children’s textbooks. (Ian Black, ‘1948 no catastrophe says Israel’. Guardian.co.uk, 22 July 2009; accessed 23.07.09. 10 Petition to the Organizers of the 10th International Architecture Biennale Venice, September 2006. apjp.org Accessed 15.07.09. 11 Edward W. Said, Freud and the Non-European, London & New York: Verso, 2003, pp 46-50. 12 The following year Jacir was awarded the Guggenheim’s Hugo Boss prize for artistic excellence. 13 The poet Ghassan Kanafani, cultural director of the PLO, was murdered in Beirut in July of that year, prior to the Munich massacre. 14 Don J. Cohn, ‘Protest and Resist: The Art of War, Far from the Battlefield’, ArtAsia Pacific, 63, May/June 2009, pp 160-161. Cohn is the magazine’s Senior Editor. For a supposedly liberal arts magazine, Cohn’s review is an astonishingly crude attempt to discredit the Palestinian artists concerned, and full of the biases and omissions of which he accuses them. Amongst other veiled sarcasms, he takes a snide swipe at ‘American citizens’ as if he were unaware of the citizenship difficulties faced by Palestinians. The journal has since published a more conceptually reasoned response to Cohn’s criticism: Gregory Sholette, ’Digging Beneath the Surface: Brechtian Aesthetics and the Venice Biennale’, ArtAsia Pacific, 64, July/August 2009, p 16. 15 nablusguide.com/ENwael; information extracted from Janet Venn-Brown (ed), For A Palestinian: A Memorial to Wael Zuaiter, (1984), London: Kegan Paul, 2006. By contrast, Mossad’s murder of and indictment for an innocent waiter in Norway mis-identified as a terrorist (the ‘Lillehammer affair’) is a matter of judicial record. 16 Edward Said, ‘Speaking Truth to Power,’ Representations of the Intellectual: The 1993 Reith Lectures, London: Vintage, 1994, pp 63-75. 17 Salwa Mikdadi, Palestine c/o Venice, op cit, p 10. 18 Riwaq, established in 1991 and officially ratified in 2004, is a Ramallah based non-profit non-governmental organization whose main aim is the protection and development of architectural heritage in Palestine with Community Out-Reach activities implemented in close cooperation with the public and the private sectors of the society. 19 Palestinian Art Court-Al Hoash, International Academy of Art Palestine, Al-Ma’mal Foundation for Contemporary Art, A. M. Qattan Foundation, Riwaq Centre for Architectural Conservation, and the Ethnographic and Art Museum at Birzeit University. 20 Perhaps the most ancient cross-cultural influence is the glass-blowing tradition of Murano, which is thought to have originated with the Phoenicians, brought to Venice during the Roman period, and still exists as a family workshop tradition in Hebron. 21 Emily Jacir, Palestine c/o Venice, op cit, p 48. 22 R. Jay Magill Jr., ‘For Gregor Schneider’s cube, a long pilgrimage’, International Herald Tribune, April 16 2007; and nytimes.com/2007/04/16/arts; accessed 24-07-09. 23 We now witness the practice of unlawful killing of photo-journalists by the Israel Defence Forces: Raffaele Ciriello, Italian photographer, Ramallah 2002; Tom Hurndall, British photography student, Gaza 2003; Ibrahim Al-Atlah, cameraman for Palestine-TV, Gaza 2006; Mohammad Az Zanam, photographer, Gaza 2006; Fadel Shana, cameraman Reuters, Gaza 2008; this list is not definitive. 24 Diane Langford, ‘Operation “Hasbara”’, Palestine News, op cit, p 16. 25 A particularly insensitive UK example – given that it was staged little more than a month after the Gaza massacre and given Tel Aviv University’s documented complicity in the technologies of occupation and war – was the Science Museum, London, and Manchester’s Museum of Science and Industry’s acquiescence to an ‘Israeli Day of Science’ designed for schoolchildren, funded by the Zionist Federation of Great Britain. See Charles Jencks, Mairead Maguire, et al, ‘Museums should cancel these Israel Days of Science’, The Guardian 16 February 2009; and Afrika Akbar, ‘Science Museum accused over links to Israel’, The Independent, 3 March 2009; accessed 03.03.09. Whilst it is common enough for science museums to celebrate the achievements of individual scientists, valorisation of a nation-state is unprecedented. Given also the current lack of trust in British foreign policies by its ethnic constituencies, it would be rather more intelligent and appropriate to inform schoolchildren of the immense historical debt Europe owes to Arabic sciences. 26 ‘Bowen “breached rules” on impartiality’, independent.co.uk/news/media/tv-radio, 16.04.09; and Cnaan Liphshiz, ‘BBC panel finds broadcaster breached guidelines on Israel’, haaretz.com/hasen/spages/1078501; accessed 16.04.09. 27 Sharif Hikmat Nashashibi, ‘BBC and Al Jazeera Coverage of Israeli-Palestinian Violence’, Arab Media Watch, pdf accessed through guardian.co.uk/commentisfree/2009; accessed 26.06.09. 28 Joseph Massad, ‘Permission to Paint: Palestinian Art and the Colonial Encounter’, Art Journal, Fall 2007, pp 126-133. Ankori’s book, Palestinian Art, London: Reaktion Books, 2006, is compared with Boullata’s Istihdar al-Makan, Dirasat fi al-Fann al-Tashkili al-Filastini al-Mu‘asir (The Recovery of Place: A Study of Contemporary Palestinian Art), Tunis: Al-Munzammah al-‘Arabiyyah lil-Tarbiyyah was al-Thaqafah, wa-al Funun, ALESCO, 2000. A more sympathetic review of Ankori’s book by Tania Abu Kishk nonetheless points out the errors that outsiders can make when attempting to author Palestinian history: ‘Palestinian Art: Gannit Ankori’; iran-bulletin.org/book%review; accessed 27.06.09. 29 A brief account of this episode is presented by Marc Perelman, ‘Israeli Art Critic Wins Legal Battles’, http://www.forward.com/articles/13662, Thursday June 26 2008. 30 Peter Noorlander, Media Legal Defence Initiative, quoted in Sheila S Coronel, ‘What Price Press Freedom?’; guardian.co.uk, 11 April, 2009. 31 Thomas Keenan and Eyal Weizman, ‘The Barber Trial: Sivan vs. Finkielkraut’, Cabinet Magazine Online, no 26, Summer 2007; accessed 24.04.09. 32 The Israeli Project’s 2009 Global Language Dictionary, downloaded as pdf from Richard Silverstein, ‘Defending the indefensible settlements’,; guardian.co.uk/commentisfree/cifamerica/2009; accessed 14.07.09. 33 Peter Beaumont, ‘Netanyahu turns to Nazi language’, guardian.co.uk/commentisfree/2009/july 10 2009. Likewise, Foreign Minister Avigdor Lieberman is reputed to be urging diplomats abroad to circulate a 1941 photograph of the Grand Mufti of Jerusalem with Hitler in his (unsuccessful) appeal for support for Arab nationalism. Donald Macintyre, ‘Israel uses Hitler picture to sell its settlement expansion’, The Independent 25 July 2009; accessed 25.07.09. What Israel does not publicise is that in 1939, following a British White Paper calling for conditional independence for a unitary Palestinian state and protection of land rights against Zionist acquisition, the Zionist Stern Gang called for an alliance with Axis powers against the British forces in Palestine. Kamal Boullata, Palestinian Art 1850 to the Present, London: Saqi, 2009, p 98, note 86. 34 Any hopes for an unbiased position on the Israel-Palestine situation from the British Labour government have to be moderated by the latter’s longstanding membership of Friends of Israel and complicity with pro-Israeli lobbyists and media moguls. (‘Labour Friends of Israel in the House’, Muhammad Idrees Ahmad, Spinwatch 21 March 2005; accessed 06.09.08. Lord Levy, knighted and appointed by Tony Blair as his Middle East Envoy for the duration of his premiership, was also chief fund-raiser for the Labour party as well as several Jewish and Israeli organisations. Gordon Brown, invited to be a Friend of Israel on his accession to Prime Minister, has now announced the appointment of Ivan Lewis – Vice-Chair of FOI, Jewish supporter of the assault on Gaza and of the State of Israel – as Minister of State at the Foreign and Commonwealth Office with responsibility for Middle East policy. This continues a pattern of appointing Zionists in ‘mediating’ roles that began with the appointment of the British Zionist Sir Herbert Samuel as first High Commissioner to Palestine under the British Mandate. 35 Bekah Wolf, ‘Q: Where are the Palestinian Gandhis? A: In Jail’, Palestine News, op cit, pp 6-8.